Mime sentences/words – Carol Gaab: Student stands in front of board with their back to it. Point to a word/sentence and class has to mime/gesture the word/sentence while student has to translate. 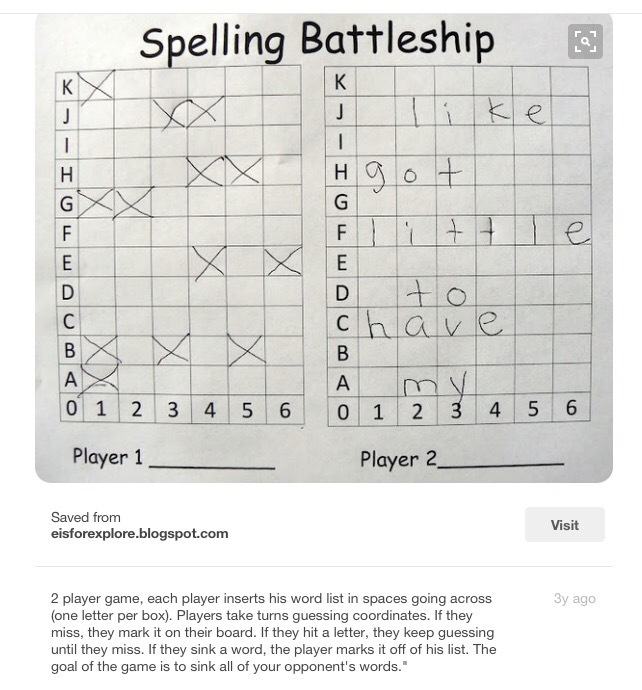 Spelling Battleships – incorporates both focusing on new target structures as well as numbers & alphabet! See here for how this activity could be used really effectively. Students are in pairs, and each have a dry erase board with markers. Designate Partner A and Partner B. For Round 1, Partner A faces the screen and Partner B turns their back to the screen. Project the PPT. I tell everyone the category for each round. Partner A looks at the list of words on the screen and draws a picture for each vocab. word. S/he draws picture 1 in quad 1, picture 2 in quad 2…etc. Partner B writes the vocabulary word which s/he thinks the picture represents in the appropriate quad. They can’t talk or gesture or write words/numbers – ONLY pictures. The round ends with the first pair who successfully finishes all 4. It is also helpful to have students sit next to a partner (although they all do their own work), but you can have them move around the room too if that works with your class energy levels. 1. Give students a word to draw – make sure it is spelled out on the board / projector / word wall. 2. Give them 2 minutes to draw a picture of the word (i.e., what the word means). 3. They should also hide ‘secret agents’ in their sketch – the letters of the Latin word. Backwards Charades – La Maestra Loca – would also be fantastic as a post story activity! Read Aloud – (Keith Toda) Split students into pairs of two and provide each with a copy of the text. Have them take turns reading each paragraph out loud to each other. Here’s the kicker—make two copies of the text that slightly differ from one another. As students read out loud, their partner must listen and highlight the differences between what they’re reading on the paper and what their partner is saying out loud. Clever reading idea – Barbara Horváth (Facebook iFLT/NTPRS/CI Teaching) I gave everyone a copy of the story we’d been working on and asked them to use a corrector to white out 16 (there are 16 kids in the class) content words in the story. I also asked them to write the deleted words in random order at the bottom of the page. Kids then passes their stories to the kid sitting to the left and had to fill in ONE of the gaps in the story. I also asked them to read all the gaps filled in and see if they had the correct words in them. The papers got passed around until everybody got their own stories back (a good 25 minutes). The kids enjoyed the task a lot and had a fair amount of reading practice too. The activity was differentiated because each student got to choose the gaps they could handle, plus the fast processors didn’t need to use the list at the bottom of the page. & AnneMarie Chase (iFLT/NTPRS/CI Teaching) – Everyone has a whiteboard and marker. We establish the details, circle, etc for the first scene. Then, teacher repeats the story slowly and students only illustrate what the teacher says. After 3-4 sentences, all students pass their whiteboard to the student sitting next to them. Teacher repeats the first few sentences and students have to point to that detail on the board they just got, and if it’s missing, draw it in. Then teacher tells the next few lines of the story while students add those details to the board they got. Then everyone passes, teacher repeats the previous lines, students look for and add in those details and then teacher tells a bit more of the story, then they pass again. It’s hilarious because the pictures become a jumbled mess and awesome because they hear so many reps! In the picture, it’s the first scene of the story, illustrated by 3 different people before we ran out of time. The Unfair Game/ Word chunk Team Game – Rebekah on CI Liftoff (Facebook) posted her version and Martina Bex also has a post about other versions of this game as does Keith Toda. 1. Each student works with a partner/group of three. 2. Each team gets one whiteboard and one marker. 4. I tell them the phrase/sentence. They cannot start to write until I say “ayo/vamos”. 6. First group/pair finished & correct gets 10 points and stands up. All other teams with the right answer get 5 points. If they roll points (positive or negative) teams keep track on their whiteboards. Trade/Tukar: I tell all the teams (in TL) to write their points total in large writing on their white board -no lying or deception- and show the team standing. The winning team then chooses which team they want to trade whiteboards with, and thus points. Sacrifice/Serah: I tell all the teams (in TL) to write their points total in large writing on their whiteboard -no lying or deception- and the winning team decides which team, or teams, they want to give their points to. Steal/Maling: I tell all the teams (in TL) to write their points total in large writing on their white board – no lying or deception- and the winning team decides who they want to steal points from to add to their score, reducing that unlucky team to zero. 9. Repeat until time runs out, or set up the roda/wheel to remove the options that have been used and play until the end (don’t tell them the options are disappearing and enjoy the resentment when they figure it out). Gallery Walk – Divide the students into small groups or pairs and give each group a large sheet of paper. Ask each group to illustrate the main ideas of the story or a chapter. Post the sheets up on the wall around the room and students walk from sheet to sheet retelling the story using the pictures. Optional Twist 1 – Put in Order: If groups have been assigned a different chapter or part of the story, students must put them in order. Texta Grab – (Facebook ) – after a reading, students pair up with a marker or pencil between them. The teacher makes a true or false statement about the reading. If it is true, the students try to be the first to grab the marker. If they get it first, they get the point. If the statement is false, they do not touch the marker. If they grab it for a false statement, they lose a point. It was a super interactive way to assess listening comprehension.